Various Native American tribes – the Huron, Algonquin, and Iroquois – have inhabited the Montreal area for thousands of years. The Europeans arrived on the scene in 1535, when Jacques Cartier arrived on Montreal Island (named for Mount Royal) and established the village of Hochelaga. In 1605, Samuel de Champlain set up a fur trading post in the region. In the coming centuries the settlement continued to grow, and was an important hub in the fur trading business. The French controlled Montreal until 1760, when it was lost to the British during the Seven Years War. This precipitated an influx of British citizens into the city. In the coming century, Montreal continued to grow and expand its importance. The English established McGill University, Canada’s first university, in 1821. 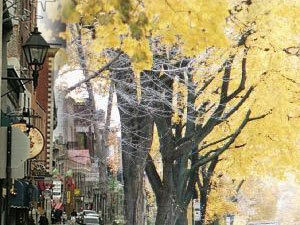 By 1860, the population was approaching 100,000 and Montreal was the largest city in British North America. Railroads and a new canal facilitated an economic boom and ushered in the city’s golden age. The Royal Bank of Canada building became the tallest building in the British Empire in 1928. The Great Depression was a major setback, but soon afterwards the city began to grow again. Skyscrapers began to spring up, though municipal regulations dictate none can be taller than Mount Royal at 205m. The city entered another era of prosperity in the 1960s. Unfortunately, two white elephants – Dorval International Airport (planned to be the world’s largest) and Olympic Stadium (which has cost more than $1 billion) – have tempered the city’s prospects. There has also been turmoil regarding the Quebecois independence movement. Nonetheless, Montreal is a beautiful and prosperous city with a bright future.